Today I'm showing you the last of the card fronts I made on my recent Facebook Live video. Make sure you like my page so you don't miss out on any of my live tutorials or give aways! 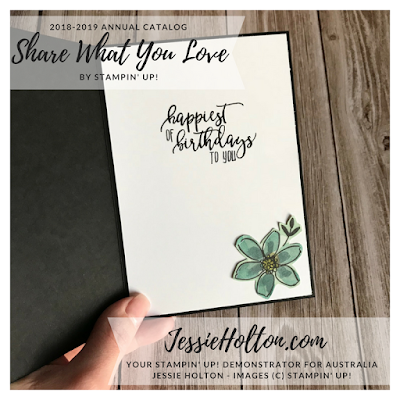 I have also added a fussy cut flower from the Share What You Love DSP & the sentiment is also from the Picture Perfect stamp set, inked in Basic Black. Click here to see my Facebook Live video. Make sure you like my page so you don't miss out on any of my live tutorials or give aways! Come along to my Supercalifragilisticexpialidocious Stamp Camp! You will complete 32x cards & envelopes, 7x 3D projects & one Memories & More Album using 8 different sets/suites, PLUS the chance to WIN BIG in our MEGA Bingo Game! All of the stamps, dies, punches & embossing folders we use over the two days will be up for grabs in the Mega Bingo Game on Sunday evening! You will also receive lots of treats, tips & ideas over the two days & make lots of new friends along the way! Just $265!! Click here to see my Facebook Event for full details. Not on Facebook? Click here to see my Online Stampin Up Calendar. 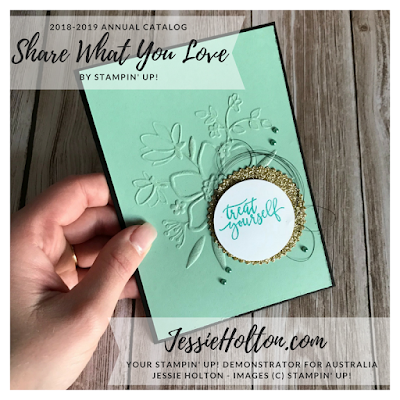 For those of you keeping up with my goal to get the Stampin Up! Incentive Trip this year, I’m still on track! Thank you to everyone who has shopped with & supported me this year! Please keep cheering for me! Last month I was on 106k Flex Points, this month I’m up to 115k Flex Points & I need to get 160k Flex Points by 30 September to get the trip. It’s going to be close & every little bit is helping me get closer, so thank you for your support! Buy 3, Get 1 Free DSP Sale is back on! But only until 31 July! These are some of the products I have used in today's cards. Click the image to go to my online shop. 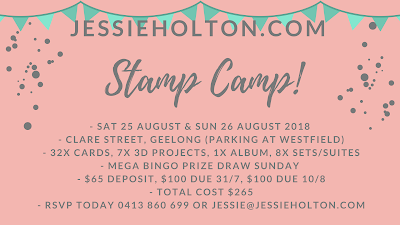 Remember to use my July Hostess Code DMBKGZ3G & spend over $50 (plus post) to go in my monthly customer draw ($50 Voucher) & you'll also receive a hand made card from me & the gift of the month!